Although the A3000 looks like an Alpha SLT model with its built-in EVF and SLR layout, it’s more akin to the Sony A7 mirrorless models. Instead of full-frame it features a slightly smaller than standard 23.2 x 15.4mm APS-C type CMOS sensor and it has an E-mount intended for the firm’s range of lenses for NEX cameras. 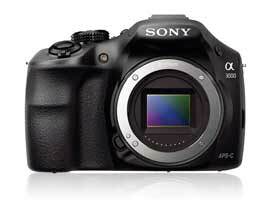 Apart from the built-in EVF and 20-Mpix sensor, the A3000 is intended as an entry-level model, much like the NEX-3N. As a result it lacks some of the refinements of recent models. Sensitivity runs from ISO100-16,000, for instance, and there’s no on-chip Phase Detection AF or high-resolution EVF or rear LCD panel. Nevertheless, it has a metal bayonet mount and 1/4000th second max shutter speed (and 1/160th sec maximum flash sync) with a 3.5 fps burst option. Video is strong point and although it lacks an external mic option, the A3000 can record full HD (1920×1080) video at 60/50/p/i as well as 30/25/24p in AVCHD and MP4. Although mirrorless, the camera is a lot larger than the NEX models and measures 110.8 x 58.8 x 38.9 mm. But, it is lightweight at 6.84 oz (194g). Further, the price is competitive at just under $350. 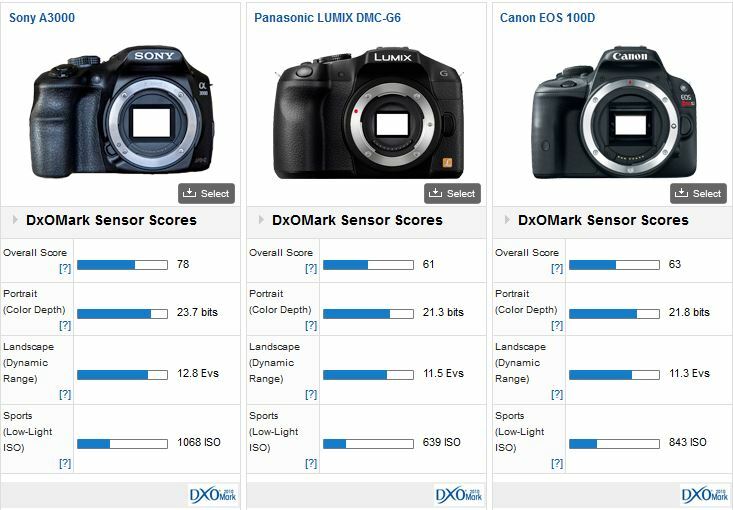 The A3000 may have a slightly smaller sensor than other APS-C models from the firm but it achieves a DxOMark score of 78 points. 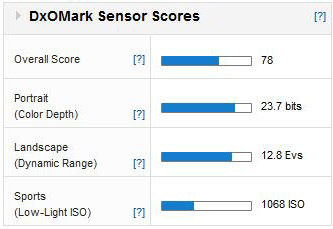 That puts it in 46th place overall, ranking alongside the NEX-5T, Alpha 77 and NEX-6 in overall sensor capability. Compared against other Sony models, the color depth matches that of the earlier full-frame Alpha 900, as well the current NEX-6. DR is slightly better than the full-frame A900 and A850 DSLRs but marginally behind current Alpha SLTs and NEX APS-C mirrorless models. Without the SLT beam splitter, low light capabilities remain on a par in real world terms with the more expensive NEX-6 and NEX-5T. Compared to the rival mirrorless Lumix DMC-G6 from Panasonic, the A3000 is ahead in our rankings by some 17 points (and around 90 places) overall. The A3000 also has a very competitive performance when compared against the Canon EOS 100D (Rebel SL1), with around a +1 stop improvement in image quality over both cameras. Individually, the Sony has +1.6 stop improvement in color sensitivity over the Panasonic and around +1.3 stop over the Canon. Dynamic range is better as well. At 12.8 Evs, it’s +1.3 and 1.5 stops wider respectively. Low light capabilities aren’t quite as impressive but the A3000 still has a sizeable +2/3 stop gain over the smaller Panasonic sensor and a +1/3 stop improvement over the 22.3 x 14.9 mm CMOS sensor of the Canon. With the SLR-like handgrip, viewfinder hump and controls, Sony is quite clearly challenging rival mirrorless models from Panasonic and Samsung. In terms of the sensor and IQ the A3000 performs very well indeed. As for the rest of specification and handling that’s another matter altogether, but there’s plenty to like and the price isn’t exorbitant.